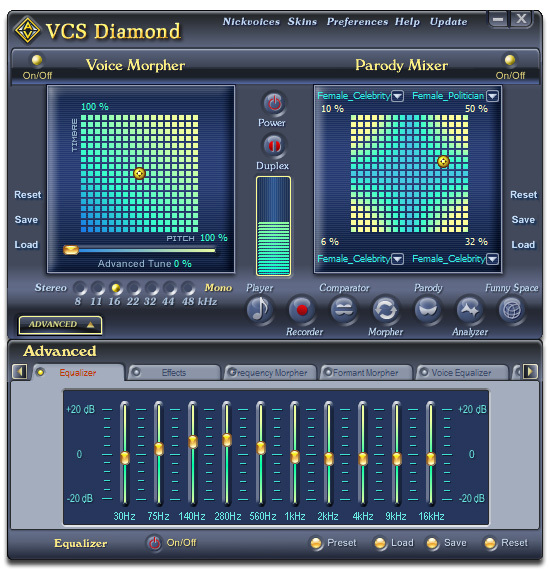 Has the thought of faking someone else's voice and fooling the others ever crossed your mind?If the answer is "YES", the "Voice Comparator" feature from AV Voice Changer Software Diamond exists for this reason! AV Voice Changer Software is well-known for its voice adjusting ability. As you all know, Timbre and Pitch are the two most important qualities of a human's voice. Now they can be changed easily with this program by making some adjustments on its Voice Morpher graph (aka Timbre and Pitch graph). This is a powerful voice changing algorithm and other sound settings are available to make your voice output more precisely than ever before. For lazy users like me,the ready-to-use preset nickvoice library is a huge help. Just in one click on a relevant voice, you can achieve your target voice such as childish voice, animal or nature sounds, alien's, witch's voices and other Hollywood-style sample voices. Step 2: Type what they say in the Phrase textbox. Then save it! 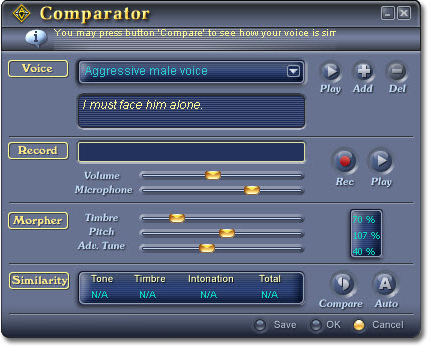 Step 4: Compare the similarity between these 2 voices and see if you need to make further adjustments to get the best output voice. Hit this link to learn more about this advanced program and its cool feature!